Amelia is an undergraduate at the University of Central Florida, where she is majoring in Writing and Rhetoric and minoring in Pre-Law in the Humanities. After graduating with her Bachelor of Arts degree in the spring of 2019, she hopes to attend West Virginia University's College of Law to obtain her J.D. Although she is not entirely sure what she wants to practice, Amelia's inspiration to become an attorney stems from her passion to serve as a constant source of positivity in people's lives in any way that she can. Amelia started off at the Coye Law Firm as an intern, where her continual desire to communicate with clients over the phone quickly got her promoted to the Social Security department. She now works in the Marketing department, where she thoroughly enjoys constructing client testimonials, editing content to be featured on our website (including these bios), and assisting with the creation of marketing materials! When she's not working at the Coye Law Firm or balancing her 5 college courses, Amelia is either working as a sales associate at Bath & Body Works, studying for the LSAT, or writing articles for her school's Odyssey platform. She's also a YouTuber (her channel name is "Amorelia"). She believes that the combination of ambition, positivity, and passion will continue to help her succeed both in and outside of the office, and looks forward to applying the skills she gains to her future legal career. 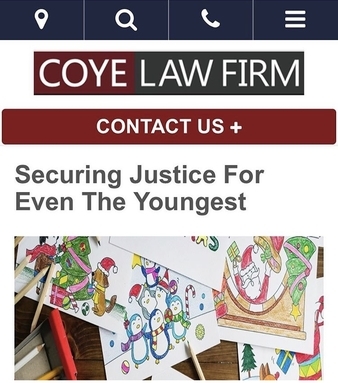 Check out her most recently published client testimonial (Securing Justice For Even The Youngest) by clicking here!